Well I do not know what to say. I’m still in shock. I know, this is not the Grammy awards, but to see that someone else, who is going through so much more than I am, recognize my blog for being inspiring, takes my breath away. It’s quite ironic I have been having a rough time these past few weeks. So I have not been able to write as much as I would like. 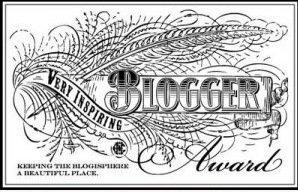 In the free time I had I wanted to check and see what others have written, and then I saw that Painfully Waiting had added my blog to one of her 7 inspiring blogs in her award. If you have time stop by Painfully Waiting’s blog. With brain tumors that are incurable, Painfully Waiting was only given two weeks to live—those two weeks have turned into 8 years. She is truly an inspiration in my books. For her to select my blog as one the 7 blogs she feels that are also inspirational knowing what she is going through; fills my heart with so much joy. My mother’s words come to mind. “Even though you might be going through a hard time in life always remember there are people out there going through a worse time than you.” I am so blessed that my mother kept me grounded. Painfully Waiting, I also want to thank you for sharing your life with the rest of us. You are the true inspiration. So now I am supposed to share 7 interesting things about myself. This is actually very hard for me. OOOO think I just got one of the 7 interesting things for me. – I don’t like tooting my own horn. It’s just not my personality. I was raised that there is having confidence and then there is arrogance. I know I am a good mom, wife or worker and person. I am not the best. I’d rather be the person still learning at 98 than think I know everything at 34. I have my opinions, thoughts and feelings just like everyone else. There is always room to grow. – I love music and I love to sing. I crank my music up, sing and do my housework. – I always root for the underdog. – Reusing items and making them useful in other ways. Example to some it was just a trunk of my mothers and was of no use. For me….I saw coffee table. I didn’t alter the appearance or even repaint the trunk to make it look new. I just put wheels on the bottom. Voila instant awesome coffee table. – I’ve never had a speeding ticket. It’s not because I am female get out of tickets….I have never been pulled over because I either do the speed limit or do 5 miles over. – I love history, genealogy and research. All three go hand in hand. With modern technology searching your family is at your fingers tips. It has made searching the family tree popular. Also with each generation that becomes an adult searching for your roots becomes important. Growing up it did not interest me. Come on how many teenagers want to spend their weekend in a archives scrolling through micro fiche trying to find a needle in a hay stack? It was something that my mother instilled that was important. Growing up on the Canadian/US border it was my mom that taught me knowing the American history is just as important as knowing your Canadian history. She encouraged World history. – I climbed Mt.Fuji….twice. My first time climbing Mt. Fuji was in August of 1998. Jack and I had only been in Japan since March of that year. It was a trip offered by MWR (it’s called something different now) and I just said “we are going on this trip” It was an absolute blast. We all had a blast. It was the first time we had gone on a vacation together (even though we had couples around us ) without our son (he was 8 months old). The bus took us to, I believe the Gotemba Station (5th Station) and we started our climb. It was not an easy climb. Hiking trails in local mountains is a lot different than hiking a 12,388 ft dormant volcano. The weather was beautiful when we started, the terrain at the beginning was more challenging than dealing with climb up and over and around the massive lava mounds towards the top. At the lower level it was almost like small glass beads of lava. We made jokes of 3 steps forward and 5 steps backwards. LOL the switch backs were the most mental part of the trip. Then at one point the clouds moved in. The rains were so cold and I’ve been in thunder and lightning storms before, but I cannot even tell you what it’s like to be in a thunder in lightening storm on the side of a mountain with no shelter. Ahhh it’s a little different when you are literally in the clouds along with the thunder and lightning. It was one of the greatest times of my life. Despite being soaked to the bone, cold, tired and hungry. While I remember the storm and what it felt like, I also remember seeing a beautiful rainbow after. I’ve seen rainbows before but I’ve never seen a rainbow basically right there in front of me. For me Mt. Fuji is a symbol of life. There will be times the climb of life is easy; there will be times the climb of life is downright hard as hell; but when you get to your destination and you SEE the hard work you have done to get to the top; the view is absolutely spectacular. Jack and I also climbed it again in August of 2000. The saying in Japan is “he who climbs Mt. Fuji once is wise; he who climbs Mt. Fuji twice is a fool.” I don’t consider myself a fool, I knew what to expect with the climb and was able to take in more of the view on the climb than I had done with the previous climb. However, the honest truth. I remember the second climb but not as well as the first climb. So those are the 7 interesting things about me. I want to take this time to thank a few people who have been a huge part of my life. My Mom – You might be gone from this world but you are still here in my heart. We had 28 years together—the longest relationship I have ever been in with anyone. Thank you for showing me that relationships take work. Most of all thank you for your support in everything I did, dreamed or talked about. Thank you for being honest with me (even though I didn’t always like hearing the truth). Thank you for even though you felt I was making a mistake (and your opinions were known )— you supported me. As much as you wanted to protect me, you still loved me, supported me even when I was making a huge mistake. Thank you for teaching me that when wrong to stand up and admit mistakes and take the consequences. Thank you for being there for every single event in my life, even if you did not agree with it. Thank you for all the life lessons, memories, love, support, debates, hugs, kisses, snuggles, laughter, tears, questions and all the things you weren’t even aware of that you were teaching me. You are always in my heart and I miss you every day. My children – You both inspire me every single day. Aside from your nana, you two will be the longest relationship I will ever be in. I have loved you both from the moment you were inside of me. Words cannot express what it feels like to know this kind of love. I have been there for every moment in your life cheering you on. Like any relationship we will have good times and bad times. Always know that no matter what, even if I am being hard on you; I always love you and that never changes. One day you will understand. And as lame as it sounds right now (just like it was lame when I heard it from my mother) when you become a parent you will understand. Thank you for being who you two are. Each of you have a different personality, goals, interests and dreams. And like I thanked nana for; Thank you for all the life lessons, memories, love, support, debates, hugs, kisses, snuggles, laughter, tears, questions and all the things you weren’t even aware of that you were teaching me. My friends – I am so blessed to have true friends in my life. Whether we have been best friend since 1st Grade or have met each other long our travels of life, you are all special to me. Thank you for being there through the absolute happy times; but most of all thank you for being there through the absolute worst times. Miles and even countries may separate us but always know if you ever need me I am there for all of you, even if it’s just a phone call at 3 in the morning. To the people who have let me down and put me down—THANK YOU! I am stronger than you will ever know, because of it. The Forgotten Wife – She takes us through her life during and after a divorce. I encourage you to read her perspective; not everyone’s journey through this is the same. However, there is a lot of self growth during this time regardless of what the journey entails. I enjoy reading her blogs; not because she and I are going through the same thing, but she gives me another view outside the box. Better Than Yesterday – A guys perspective of what he is going through with life. His writing is absolutely fabulous. I have truly enjoyed reading about his journey and his perspective. A Place For Me and My Thoughts – This blog is about a mother of an “adult” son who is not ready to grow up yet. While she will take some heat for speaking her mind—she is honest. Margaret & Helen – I stumbled upon this blog and these two ladies say it like it is. I absolutely love their take on current events. Sometimes you just gotta laugh. The Simple of a Country’s Man Wife – I enjoy this blog because it brings me back home. You can take the girl out of the country; but you can’t take the country out of the girl. Live. Explore. Learn. Remember – For me this is the latest blog I have been following. While only having time to read just a couple of their posts they too inspire me.